The beige-brick building. 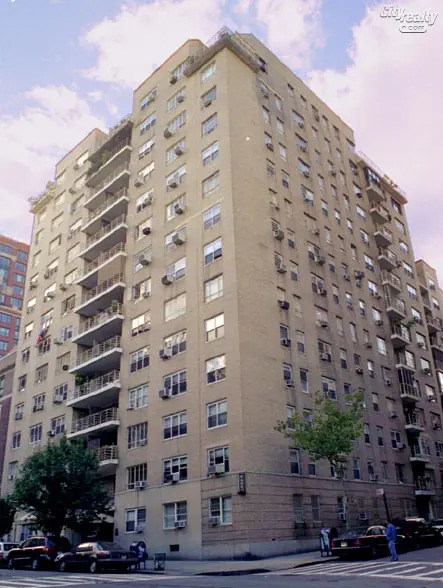 which has a doorman, was designed by Hyman Isaac Feldman in 1951 and is notable for the delicate balcony railings with diagonal patterning in the center of its avenue frontage above its canopied entrance. The balconies protrude a bit from the rest of the façade making the handsome railings even more visually pronounced and the overall effect quite remarkably demonstrates that a little design "touch" can easily transform a boxy, uninteresting building design into something considerably more elegant. Here, the balcony railings are not only the building's "highlight" but its main focus and detract attention from the building's otherwise pedestrian elements. "This 14-story apartment building occupies a prime site across from Carl Schurz Park on the southwest corner of 85th Street at 110 East End Avenue.